Synopsis – Now it’s time for the first non-traditional episode we’ve come across. Instead of looking for an established killer over the span of a couple of days, this one is set entirely over the course of a few hours, with the team being intimately involved in the activities from the beginning. Heck, even the intro is a surprising twist on conventions. The Blonde enters Greg’s office and enquires where New Girl has gone off to. Greg responds that she’s in Texas, on her way to giving the VICAP questionnaire to a ‘child-killer’. This is an accurate portrayal of how the Behavioural Sciences Unit actually, um, behaves. Their ability to ‘profile’ killers is dependant primarily on time they spent interviewing other killers already in prison, and putting them through a standard therapy work program. This is based on the idea that either convicted serial killers will tell the truth about their thoughts, feelings, and actions to the cops, or at least that all of them will lie in similar enough ways that the confluence of falsehoods can be somehow useful. The most famous example of this being used is the case of a detective who went to Florida to get Ted Bundy’s help in understanding the Green River killer. It wasn’t his idea – Ted wrote and offered his help. While this series of interviews did, in fact, give future profilers a window into the mind of a psychopath, compile a useful psychological profile of the Green River Killer himself, and allow Cary Elwes the chance to play Bundy in a passable adaptation of the events, they were in no way useful in actually catching the Green River Killer. So while I’m not saying New Girl is actually out and out wasting her time, with the amount of serial killers running around in the world of Criminal Minds it seems there might be better uses for it. Anyhow, back to the story, where New Girl (or, since the episode centers around her, finally forcing me to learn her name – Elle, which, by the way, means ‘she’, so ‘Girl’ really isn’t that far off…) is on a train headed to the prison where the murderer she wants to interview is being held. Now, at this point, you may be asking yourself – why is she on a train? That is in no way a bad question to be asking. It’s not like she could have taken the train all the way from Virginia – I know I was joking about ‘better uses for her time’ earlier, but seriously, there’s no way an FBI agent would spend 36 hours on a variety of trains instead of taking a 4-hour flight. This is one of the myriad things that I’m far from expert in, but wouldn’t she fly to the airport nearest the prison and then either drive out with a local FBI agent or rent a car? So why the train? I suppose it’s just barely possible that the prison is out in the middle of nowhere, and she wanted to avoid the hassle of driving after flying into the city, so she just hopped on a local train. Of course, that’s not possible, since the next scene will establish that the train is on its way to Dallas, one of the bigger cities in the state. Where did she fly in to before transferring to the train? So why the train? There’s really no good answer to this one. I’m guessing that the writers just needed Elle to be on a train, and they hoped that no one would bother asking why on earth she’d ever take one. Well, I’m asking. Let’s see if the episode bothers answering the question. Is she having second thoughts about the abortion? Is her relationship with Jesus responsible for this change? We’ll never find out, because she’s not the focus of the episode, and these vignettes are just about showing that all the people on the train have real lives that are being interrupted by what’s about to happen. That they’re all taking this particular train at a pivotal moment in their lives is just the writers’ attempts to ramp up the emotion of the situation while dialing back the plausibility. The third passenger to be profiled is a distraught businessman whose wife has left him. He’s on his way to Dallas with a gun in his briefcase, although whether he’s planning to kill his wife or just kill himself in front of her is, as ever, maddeningly unclear. The fourth passenger profiled is a doctor who’s bringing a patient of hers to Dallas for a conference, even though her colleagues don’t think he’s ‘ready’. 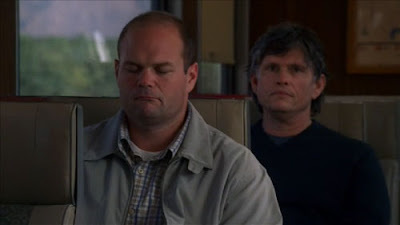 Finally there’s Frank Sobotka off of The Wire, who does not get a flashback. A quick phone call between Elle and Gideon establishes that yes, she decided to take the train from El Paso rather than renting a car because she wanted to look over the files, although you’d think she would have had plenty of time on the plane to look them over. While she’s talking Frank observes her warily. He sees that she’s got a folder from the FBI, and this triggers his disturbed secondary personality, Leo, played by Jeff Kober! Interestingly, in the game ‘Manhunt 2’ the schizophrenic alternate personality who spends the game whispering in the main character’s ear and encouraging him to kill is also named Leo. This makes me wonder if a famous schizoprhenic killer had a demon on his shoulder named ‘Leo’, or if it’s just a coincidence. Just as Frank has started to go nuts the train stops because a person committed suicide by jumping in front of the train, and they’ve got to wait for the police to come and investigate the remains. Seeing a transit cop walking towards him sets Frank off, and he grabs the cop’s gun and shoots him to death before Elle can intervene. He also manages to pistol-whip and disarm her before she can react, so her reflexes should be considered highly suspect at this point. It turns out that Frank was the crazy person that the doctor was taking to Dallas for a symposium, so her colleague was right, and he was fundamentally not ready for the trip. Opening credits! In the office the team is already looking at the live footage from the train’s video cameras. In an incredible coincidence, they weren’t called in because one of their colleagues was on the train, just because the guy seems crazier than your average hostage taker. I wasn’t aware they called in the FBI for that, but hey, it’s their show. Although it seems like having one of their teammates on the train would have been an excuse for them to muscle their way in, but let’s move on. We immediately cut to the team driving to wherever it is the train has stopped, meaning that their plane got them there incredibly fast. Suspiciously fast, actually – it’s not clear when any of this is taking place. Let’s say Elle left that morning from BWI – it makes sense that she’d fly from Washington since it’s far closer to Quantico than Richmond. There’s no such thing as a direct flight from there to El Paso, so it would have taken her at least six hours to get there. Even with the two hour time difference, by the time she got to El Paso it would be 2PM. So she gets on the train at 1 – except there’s only one El Paso-Dallas train each day, and it leaves at 9AM, which means she should have been able to spend the night in her El Paso hotel room studying the file… but let’s move on, and pretend she was able to get on a train at 2PM (Central Time). Even if the train had only been going for an hour when Frank went nuts and it took half an hour to call the FBI in, it’s already 2:30 when the team figures out Elle’s on the train. Let’s be charitable and say the team can get their plane in the air within a single half hour of knowing they have to go somewhere. It’s still a four-hour flight to El Paso, and then another hour to drive to where the train is stopped. So, assuming that Elle took the 9AM plane out of BWI (the earliest flight offered), by the time the team arrives on the scene it should already be 8:30PM, CST. Does this look like 8:30 at night to you? Please not that the local field agent is played by Big Smith! So nice to see him on television now that he’s been killed off on Lost. As the team drives to the scene they go over the details of the case – it seems that Frank’s particular psychosis has turned him into a paranoid who demands to deal only with a ‘higher authority’. Meanwhile, inside the train, people are only now starting to discuss the situation, after a full five hours of hanging around together. Which is convenient for us, the audience. While the hostages are chatting Frank stays by a half-closed window, staring at the gathered police. It was at this point that I wondered why they didn’t just shoot Frank. He’s one guy, and most of the time he’s not pointing the gun at anyone. Normally a lack of information about his position in the train would provide an obstacle to an effective murder, but it’s been established that they have security cameras watching his every move. Wouldn’t it be the simplest thing in the world to have a HRT (that’s FBI-ese for SWAT) guy crouching behind one of the doors at the end of the train, wait for him to turn away, and then quietly open the door and shoot him a few times? I suppose that, while effective, that solution wouldn’t involve profiling, so it’s not being considered. After getting the details from the agent in charge of the scene Reed mentions how hard it can be to work with a psychotic because of the wide variety of forms their delusions can take. They even name-drop the John Nash situation, the brilliant mathematician who thought aliens were telling him how to save the world. Later in the episode Frank will be revealed as a brilliant physicist who’s having psychotic delusions, which only goes to highlight the dangers of pointing out the specific real life thing you’re ripping off while you’re ripping it off. For a better example of this, please consult the worst book ever written, “Loverboy”. While Frank is busy going nuts on the train, Mandy tries to figure out how to get him to start conversing with them. They watch him dragging the pregnant woman around the train by her hair, pointing a gun at her, but don’t’ think this has yet become a situation that requires violent intervention. He gets her to call Mandy and tries to figure out which mysterious government agency Mandy is with. Finally he reveals his specific psychosis – he’s one of those people who thinks he’s being tracked with an implanted microchip and he wants it removed from his body. As the team tries to figure out just how to ‘remove’ something from Frank’s body, the hostages on the train are talking again. The drunken Indian man, proving himself to be quite an idiot, agrees with frank that people are being watched all the time by the government, and thinks it’s suspicious that there happened to be an FBI agent on the train. No, it’s not suspicious, it’s a contrivance, and they’re allowed one per episode. Then the Indian actually starts to yell at Frank, apparently because he wants to be shot to death for some reason. The Doctor manages to calm Frank down, and displays his brutally scarred arm to the security cameras, allowing the team to figure out just where the fake microchip is supposed to be. Reed brings up the actual case of a man who held a classroom hostage while demanding to have the microchips taken out of his body. See above in re: not mentioning the real-life thing you’re ripping off. His favorite book is ‘Fear and Loathing in Sunnydale’ one of the collections of academic papers about Buffy the Vampire Slayer, and his movies identify him as an Oliver Stone fan, which backs up him being a conspiracy theorist. Excellent work at putting work into a place no one will ever notice it, behind the scenes guy! That’s the kind of set dressing every show should have. After spending a minute going over the people on the train, Derek (the black guy) is nice enough to point out that none of the information is going to be useful at resolving the situation, because even if one of their personality types could worsen things, it’s not like they could do anything about it. The bigger problem is what to do about the surgical solution to the microchip situation. Reed comes up with a suggestion: palm a tiny microchip, cut into his arm, and then pretend to pull the microchip out of it. As the planning continues, the Doctor decides it’s time to try and talk Frank down. She suggests letting everyone but her go, but Frank freaks out once again, further stalling the situation. Mandy calls Frank on the phone and agrees to send Reed in to perform the surgery. They extract a microchip from a radio, put some body armor on the geek, and send him into the lion’s den. 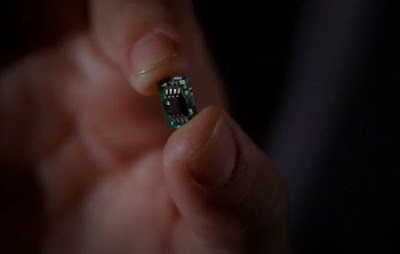 Ridiculously, the microchip is just a black chip sautered to a piece of circuit board, without a piece of plastic covering it to both it and the human body from suffering any kind of a negative implantation reaction. Reed heads into the train, ready to play into Frank’s delusion. All told, it actually goes pretty well, Frank gets through the arm cutting and fake extraction without actually shooting anyone. The Indian finds the fake-out persuasive and actually believes the conspiracy theories about the government putting microchips in people’s bodies. Once it’s outside of his body, though, Frank demands that Reed turn the chip on, confusing the situation for everyone involved. 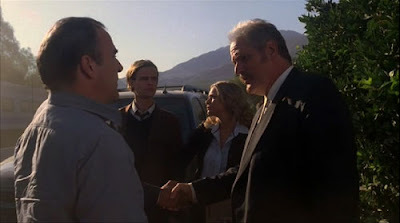 Outside, Greg asks how hard it will be to kill Frank, and he’s told that it will require 2 shots, one to destroy the window, and another to kill him, making it a risky proposition. I’m still not clear on why there isn’t a HRT guy on the train already – he can’t watch the front or back of the train from where he’s sitting, so how hard could it be to just climb aboard and crawl down the aisle until you were just on the other side of the car door, within easy shooting distance? They come up with a quick lie to explain to Frank why the chip won’t work out of his arm, but it doesn’t convince the psycho to let Reed off the train. Now Reed is trapped on the train and I’m wondering why they didn’t demand that they release one of the hostages in exchange for putting Reed on the train. Mandy tries to call Frank, but he’s too stressed to answer it. The Drunken Indian thinks this would be a great time to try and switch over to Frank’s side, which only succeeds in agitating Frank enough to have him fire a shot, which hits his doctor instead of the annoying drunkard. Somehow, the fact that Frank has shot another passenger in no way causes the HRT to immediately storm the train. This implausible scenario gets worse when all of the hostages rush over to help the fallen doctor at one end of the train, while Frank wanders over to the other end to answer the phone. Now Frank is completely isolated from the hostages, facing away from them, and he’s proven that he’s willing to kill them all. Again, this doesn’t immediately result in the FBI rushing the train and killing him. It’s only after Frank shoots the phone rather than answering it that Mandy agrees to prepare the HRT to rush the train. Meanwhile, Reed tries to talk Frank down by acknowledging that Leo is a real person, and working a quick profile of Frank. This succeeds in confusing things just long for Elle to push Frank to the ground, and the businessman to pull his gun and shoot Frank. Sadly, the shooting is non-fatal, allowing for a coda in which he’s rolled off to the hospital while Elle grows concerned that Reed’s ability to empathize with Frank during the impromptu profile means that he’s secretly crazy as well. It seems that Elle doesn’t understand that the entire point of their jobs is to empathize with the crazies. How did she ever get on the team? Dear lord, no. While they spent a bit of time profiling Frank right at the end, it was totally irrelevant. They try to make it seem like Reed’s profiling had something to do with his defeat at the end, but Frank spent half the episode standing distracted beside Elle. She could have shoved him at any point, and had the same result. What’s worse, they didn’t actually have a plan beyond the shove – if the businessman hadn’t been carrying a gun, the shove would have only resulted in all of them getting shot. Absolutely. The HRT had opportunities stacked upon opportunities to kill Frank, they just never bothered to do it. The only thing their hesitation accomplished was to allow another hostage to get shot. Not a great day for the FBI, this time. 0 – You know, when I made the scale of pro-fileyness span from Dirty Harry to Tony Hill, it never occurred to me that you could get even farther away from profiling than Harry Callahan. Criminal Minds managed it this week, as the villain was defeated not by any form of law enforcement, but a random bystander who just happened to be carrying a big gun. So I think that deserves a zero. At the end of the episode it’s made abundantly clear that Frank survived the shooting, but we have no idea if his doctor did. I’m a little more concerned about her than him. Also, we never found out if businessman was planning to kill his wife or not. And what was going on with pregnant abortion lady? Did they seriously just make her pregnant so that we, the audience, would be more worried about her being put in danger? Because it never effected the episode in any way. In what might constitute a bold and controversial message for a show about profilers to contain, this week’s episode made a passionate and compelling argument that they should never be let anywhere near a hostage situation. 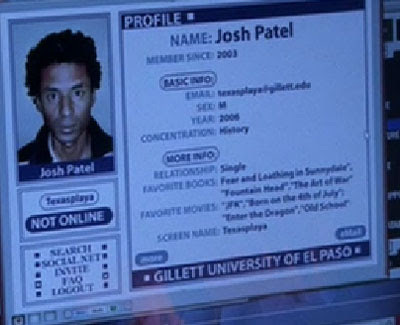 Interesting choice, Criminal Minds. The reason they didn't kill Frank earlier was because they wanted to get everyone off the train alive. Including Frank. The flight math is even dumber, Dallas is a hub and she could easily have gotten a direct flight there in 3 hours. No reason in the universe to fly to El Paso and take a train to Dallas.